Local recommendation service Bizzy is hoping users can make its personalized suggestions even better by introducing a new mechanism: the check-out. Instead of checking in to a location, something we’re all familiar with from Foursquare, Gowalla and others, Bizzy is asking its mobile app users to rate a place when they check out. The information will be added to a place’s rating, but more importantly, it will help further inform Bizzy about a user’s tastes for future recommendations. Bizzy’s hope is that by making it very easy for people to rate a place, they’re building a well of structured sentiment data that can be useful for Bizzy and the user. 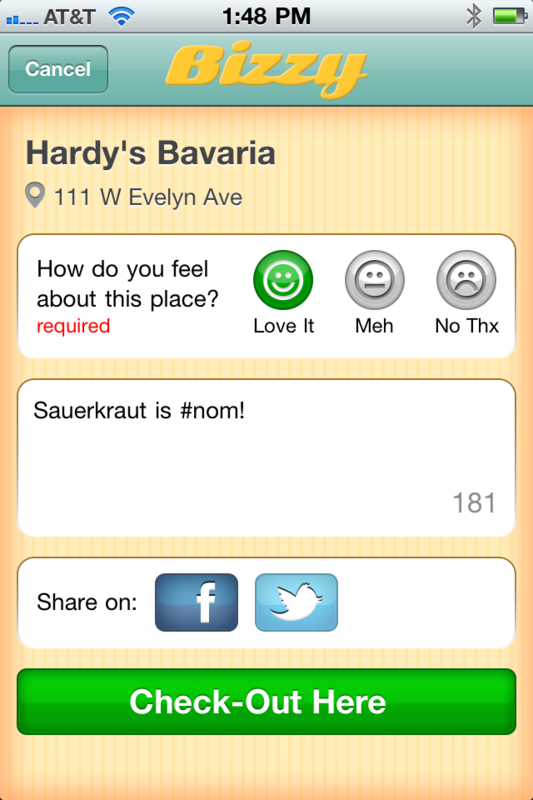 Users can rate a place with a happy face, meh face or sad face and they can leave a tip for others. The rating can be shared on Facebook or Twitter, but there are no ways to follow specific friends and their tastes. The check-out information allows Bizzy to match a user’s response to others with similar tastes to pull out new recommendations. The check-out is now incorporated into Bizzy’s iPhone (s aapl) and Android (s goog) apps. This is part of a larger push by location services to use their data for recommendations. Bizzy, a subsidiary of ReachLocal, relaunched with this goal in November, asking users to list their favorite places and then building recommendations off it. So far, Bizzy has produced more than 1 million recommendations based on 140,000 places that have been favorited. But a one-time poll of favorite places doesn’t evolve with a user and track their changing interests over time. That’s where the check-out comes in, said Gadia Shamia, Bizzy founder, president and general manager. Shamia said the check-out is powerful because it’s a quick way to gather information, and it allows users to identify the places it thinks Bizzy should use for recommendations. A user might frequent a deli near work because it’s close by, but he wouldn’t necessarily want to get a recommendation based on that. The check-out allows people to not only explicitly steer recommendations toward or away from certain places, but it also allows for neutral responses that don’t get factored in. It’s not a given that Bizzy will popularize the check-out. It’s one more thing for a user to do, so it has to have some value that’s easily and quickly realized. People write reviews on Yelp because they’re able to express themselves and contribute back to the community, creating a lasting resource for everyone. The benefits here are aimed more at the individual user, which means the resulting recommendations have to be spot-on and surface things a user may not have considered. That’s the challenge here with all these services. In order to produce great results, they need to grab as much data as possible, but they also need to cut through a lot of noise and do it all without aggravating the user. If Bizzy can make check-outs work and return some really unique recommendations, I wouldn’t be surprised if others follow. But it’s clearly not the only game in town even though the check-out feature name is catchy. Disclosure: True Ventures is an investor in the parent company of this blog, Giga Omni Media and in Ditto. Om Malik, founder of Giga Omni Media, is also a venture partner at True. Smart theory, kind of like a real-time Yelp. Issue will be that it’s natural (and fun) to check in to meet people and gather a crowd around you. It’s a new behavior to check out and report. One social, one solitary. New behaviors are being engendered all the time. Whether this will be one, remains to be seen. I’m not drawn in to participate initially.